Eric Swalwell announced he's running for president on the "Late Show with Stephen Colbert" in April. The California congressman is structuring his campaign around gun safety, partnering with a Parkland shooting survivor and pledging to take on the National Rifle Association. "Most Americans believe that to be free of gun violence, we should take the most dangerous weapons out of the hands of the most dangerous people." — Swalwell said in his campaign video. Previous roles: 4 terms in Congress. Sits on the House Intelligence Committee. Chairman of the Intelligence Modernization and Readiness subcommittee. Gun safety: Plans for it to be his No. 1 issue on the campaign trail. During his first 100 days in office, Swalwell says he will push for a ban on military-style semi-automatic assault weapons. He also wants to enact a federal buyback of all 15 million assault weapons in the U.S. Climate change: "Most Americans agree that to address climate chaos, to make sure your house doesn't end up underwater or on fire, we should do something about it but make sure we're not pitting workers against their job," Swalwell said in his campaign video. He said he's supportive of the principles of the Green New Deal. Health care: Wants large sums of pubic money to find cures to Alzheimer's, cancer and ALS. College tuition: Proposes no-interest federal student loans and tax-free employer contributions. He also supports debt-free college for public university students in exchange for a work-study and pledge to better their communities after graduation. 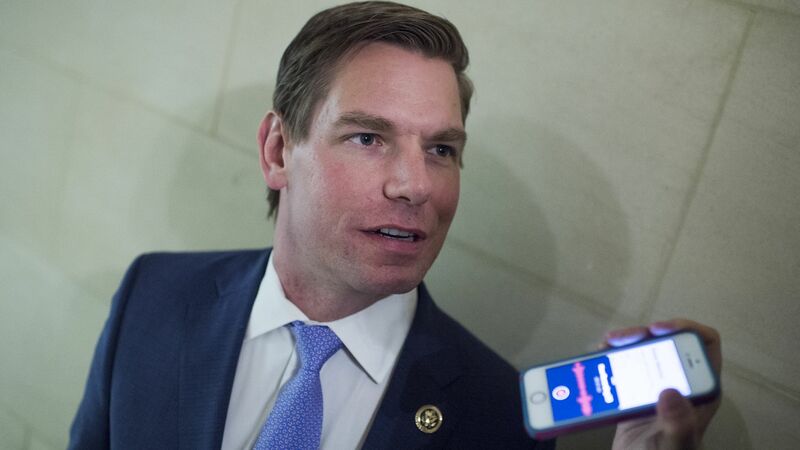 Press freedom: Swalwell has helped introduce and re-introduce this year the Journalist Protection Act, which would make it a federal crime for certain attacks on those who work in the media. Social security: In office, he has said he wanted to raise the cap on the Social Security payroll tax so the wealthy pay more into the program. Trump-Russia: He believes President Trump, the president's family and his team colluded with Russia. He said on ABC Tuesday morning that Trump "acts on Russia’s behalf too often." Notoriety: Swalwell is less nationally known than several other candidates. One-issue campaign: Swalwell is going all in on gun control, which could appear as a one-dimensional campaign while other key 2020 issues are on the table. A crowded pool: Swalwell will be the 18th person running for the Democratic nomination. His campaign slogan is "Be big. Be bold. Do good."